ABB: PV string inverters, PV central inverters, Inverters stations, Low voltage products for PV, Compact Secondary Substations, Transformers, Substations, SCADA for PV-systems. Ahjo Energia: Solar air heaters, solar electricity systems, turn key solutions. Alternative Solutions Finland Oy: Solar thermal systems and components, retail. Areva Solar Oy: Turn-key solutions for solar energy. Financing options for large plants. Aura Energia: Holistic energy service provider in Turku area of Finland. Aurinkoinsinöörit Oy: ST and PV-systems design, import of SMA products, turn key projects. Aurubis Finland Oy: Solar thermal integration with copper surfaces. Caverion Suomi Oy: Turn Key solution provider with option for leasing funding. 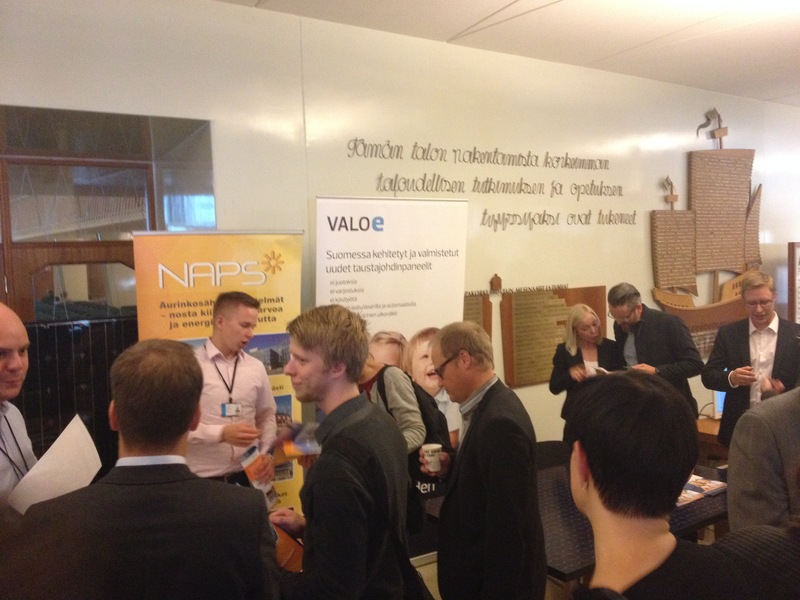 e-buildings Finland Oy: Services and products for improving energy efficiency. systems. On-site measurement for shading analysis and yield prediction. Ekenäs Energi Ab – Tammisaaren Energia Oy: Energy company with turn-key solar system deliveries. Operates in Länsi-Uusimaa region. Etelä-Savon Energia Oy: Energy company with turn-key solar system deliveries. Operates in Etelä-Savo region. Eurosolar Oy: Solar panels and wind generators. Finnwind Oy: Offgrid, hybrid and grid solutions, installation systems, mini-factory concept for local manufacturing. Fortum: Electricity company. Turn key solar energy systems. Full service chain from site assessment to system delivery and warranties. Green Energy Finland Oy: Turn key solution provider for renewable energy systems. Greenes Oy: Design and consulting on solar energy systems and hybrid solutions. Helen Oy: Electricity company. Construction and operating solar PV-plants. Solar energy related district heating and cooling solutions. Jodat Ympäristöenergia Oy: Supplier of PV-systems and related services. Kaukomarkkinat Oy: Turn key solutions in renewable energy systems. PV components and systems. Lakeuden Ekolämpö Oy: Importing solar thermal systems, retail and installation services in Western Finland, Vaasa region. Kodin Vihreä Energia Oy: Small-scale renewable energy solutions (solar, wind, biomass). Monitrado Oy: Solar thermal systems distribution, import and materials. Mäntsälän Sähkö Oy: Energy company that provides turn key solar energy deliveries. Located in Mäntsälä. Naps Solar Systems Oy: Manufacturer of solar modules.Variety of PV solutions in different scales. Customization and full-service options. NeroWatt Oy: PV-system consulting and turn-key deliveries. Nocart Oy: Hybrid renewable energy systems. Oilon Home Oy: Turn key heating systems including solar thermal. Oulun Energia: Electricity company. Investing in local and renewable energy, supplying turn key solar energy systems and purchasing produced energy. Pistoke RES Oy: Design, retail and installation of solar PV and heat systems. Playgreen: Turn-key service provider in small and medium scale on-grid systems. PolarSol Oy: Manufacturing of thin stainless steel solar collectors and heat exchangers. Ruukki Construction Oy: Solar energy systems integrated into roofing solutions and building materials. SaloSolar Oy: Producer of solar PV panels. Specialized in window-glass panels, that are produced in Finland. Solar Fire Concentration Oy: Thermal and optical engineering for cost efficient solar heat systems. Solartukku Oy: Supplier of PV and solar thermal solutions to retailers and partner organizations. Solarvoima Oy: Solar PV turn-key supplier, specialized in consumer and small business scale. Solixi: Concentrated solar power from rooftops, big layer specific outdoors boilers. Solnet Green Energy Oy: Solar energy as a service. PPA service provider. Sun Energia Oy: Solar power calculations based on geographical information. Sundial Finland: Provider of a variety of solar thermal products and services: solar heating systems and components, engineering, consulting and training services. Suntori: Renewable energy solutions and standalone clean tech products and services. Suntrica Ltd: Design and manufacturing of portable solar charging solutions. Suomen Talotekniikka Energia Mikkeli Oy: Building and renovation company. Turn key solar system deliveries. Synaptic Oy: PV components and systems for companies, domestic consumers and retailers. System plannings in cooperation with manufacturers. Telog Oy: Project management for telecom and energy. Turnkey solutions for energy production and energy saving. T:mi Ville Terävä: Aolar PV entrepeneur in Kotka area. Valoe Oyj: Turnkey solutions for the manufacturing of photovoltaic modules based on conductive back sheets, photovoltaic modules, solar power plants. D-mat oy: Consultancy and training services in eco-efficiency and sustainable consumption and production. FCG: Consulting services related to renewable energy. Gaia: Innovative expert services for sustainable energy: business intelligence, concept design, feasibility studies, resource use optimizations, and impact assessments. Granlund Oy: Consultancy services, simulations of energy production and life cycle cost calculations. Optiplan Oy: Solar energy solutions design. Construction and architecture engineering services. Pöyry: Design, engineering and consultation to variety of project phases. Studies. Thermal, district heating, CSP and PV. Soleco Oy: Solar energy consultation and project management with international experience. Soleras Oy: Designing PV systems, full range of services. Utuapu Oy: PV and solar thermal consultancy services. ÅF: Feasibility studies, planning, implementation, project management, education, sustainability. BaseN Corporation: Cloud services for managing energy production data. CO2.FI Oy: Energy certificates and auditions, design of energy efficiency measures. Grexel Oy: Energy certification, regulatory and market engineering, central registry systems. SEAM Group: Software for managing energy demand response. Solar-Arena: Productions and profitability calculations -website. Cleantech Invest: Investment portfolio for cleantech and green companies. Greenstream Network Oy: Carbon asset management, energy efficiency projects in China. Joukon Voima Oy: Crowdfunding renewable energy projects. Aalto University, FinSolar -project: Collaboration with more than 50 parters in the supply and demand side of solar energy markets.